Received: May 28, 2018; Revised: September 24, 2018; Accepted: October 5, 2018; Published online: December 31, 2018. Woman kidney donors face obstetric complication risks after kidney donation, such as gestational hypertension and preeclampsia. Studies on childbirth-related complications among Asian women donors are scarce. This retrospective cohort study included woman donors aged 45 years or younger at the time of kidney donation in a single tertiary hospital between 1985 and 2014. Pregnancy associated complications were investigated using medical records and telephone questionnaires for 426 pregnancies among 225 donors. Matched non-donor controls were selected by propensity score and the maternal and fetal outcomes were compared with those of donors. Primary outcomes were differences in maternal complications, and secondary outcomes were fetal outcomes in pregnancies of the donor and control groups. A total of 56 cases had post-donation pregnancies. The post-donation pregnancies group was younger at the time of donation and older at the time of delivery than the pre-donation pregnancies group, and there were no differences in primary outcomes between the groups except the proportion receiving cesarean section. Comparison of the complication risk between post-donation pregnancies and non-donor matched controls showed no significant differences in gestational hypertension, preeclampsia, or composite outcomes after propensity score matching including age at delivery, era at pregnancy, systolic blood pressure, body weight, and estimated glomerular filtration ratio (odds ratio, 0.63; 95% confidence interval, 0.19–2.14; P = 0.724). This study revealed that maternal and fetal outcomes between woman kidney donors and non-donor matched controls were comparable. Studies with general population pregnancy controls are warranted to compare pregnancy outcomes for donors. Living donor kidney transplantation is reported to be the most suitable method for prolonging survival [1,2] and improving quality of life  in patients with end-stage renal disease (ESRD). However, since donor organs are not in abundance worldwide, many efforts have been made to procure altruistic living donors while ensuring maximal donor safety . Generally, women outnumber men among kidney donors [5,6]. Nevertheless, women kidney donor candidates tend to have concerns about complications related to pregnancy after donation. Women donor candidates of childbearing age have concerns regarding the safety and possible risks of pregnancy after donation. First, kidney donation may decrease kidney capacity for gestational hyperfiltration to reduce renal reserve capacity. Our recent reports suggested that the absence of gestational hyperfiltration is linked to obstetric complications [7,8]. Second, kidney donation usually involves acute kidney injury (AKI), mild elevations in blood pressure , and/or reduced long-term renal function . Women with both AKI (even after recovery)  and chronic kidney disease (CKD) (even from stage 1)  are exposed to higher risks of adverse pregnancy-related outcomes. Thus, concerns have been raised regarding pregnancy-induced hypertension and related complications, such as preeclampsia, in kidney donors of child-bearing age. There have been three large studies on kidney donors and maternal and fetal pregnancy outcomes. The Norway study used national registry data for 2009 and suggested that women donors may have a higher risk of preeclampsia after adjusting for associated factors (5.7% vs. 2.6%, P = 0.026) . Ibrahim et al  presented results based on questionnaire responses and showed that post-donation pregnancies were more frequently associated with pre-eclampsia by a factor of seven. However, these studies have raised controversy due to their use of controls. Both of these studies compared post-donation pregnancy outcomes with pregnancies before donation from the same donors, not with pregnancy outcomes of the general population. In 2015, a study that overcame this limitation was presented by researchers in Ontario . This multicenter cohort study revealed that gestational hypertension and preeclampsia increased after kidney donation compared with matched non-donor controls. However, the main limitation of their non-donor controls was that they were matched without considering baseline renal function. In this study, we investigate the obstetric complications of kidney donors before and after kidney donation at a single institution for kidney transplantation over the past 30 years by reviewing medical records and undertaking telephone questionnaires. We also compared the pregnancy outcomes of kidney donors with a matched general delivery cohort at two separate institutions and considered baseline renal function. During the 1985 to 2014 study period, living women kidney donors (n = 635) were enrolled in the study (Fig. 1). We attempted to personally contact 417 women donors of childbearing age (from 15 to 45 years old) at the time of donation by telephone. Of these, 164 (39.3%) donors refused to respond to the telephone questionnaire. Among responders, 28 did not have any pregnancy experience. Finally, 225 (54.0%) questionnaires were obtained from donors with history of pregnancy. For the matched non-donor control group, general pregnancy delivery cohort data was collected from two tertiary hospitals, as described in previous studies (Fig. 1) [7,8]. Briefly, 17,432 pregnancies among 15,028 mothers from 1999 to 2014 at Seoul National University Hospital (SNUH) and 14,004 pregnancies among 11,059 mothers from 2003 to 2015 at Seoul National University Bundang Hospital (SNUBH) were reviewed. Patient records without a delivery date or baseline kidney function level based on the estimated glomerular filtration rate (eGFR) and multigravida patients were excluded from the study. Patients with previous history of diabetes mellitus and hypertension, which were usually considered exclusion criteria for donors, were also excluded for matched analysis (Supplementary Table 1). The estimated date of conception (era at pregnancy) was calculated by subtracting the age of delivery from the delivery date. The eGFR of anytime from three years before the delivery date to the estimated date of conception or for 1 year before the delivery date were used as baseline data, as previously described [7,8]. The institutional review boards at SNUH (IRB no. H-1412-104-634) and SNUBH (IRB no. B-1506/304-302) approved this study. This was a retrospective study without medical intervention, so the need for informed consent was waived for data collection. All questionnaires were completed with direct informed consent of subjects obtained via telephone. Medical chart abstraction and reviews were used to collect the baseline parameters and outcomes of donors. In the donor group, baseline parameters included age, body weight, donation type (such as related or unrelated), donation era, and donor ABO blood type. In addition, electronic medical records associated with pregnancy events of the enrolled women donors were reviewed. Changes in women donor characteristics according to transplant era were described (Supplementary Table 2). Futher details on Supplementary materials are presented online (available at https://doi.org/10.23876/j.krcp.18.0050). In the control group with non-donors, the following obstetrical characteristics were obtained before the time of delivery: age, body mass index (before and after pregnancy), medication history, history of gestational hypertension, history of overt or gestational diabetes, multipara, multigravida, and delivery method. Telephone questionnaires were used to determine and include pregnancy outcomes that occurred outside of the study hospitals. Donors were contacted at least twice if necessary to increase response rate, and the telephone contact process was performed by experienced women nurse practitioners. Donors over the age of 45 years were excluded from the phone poll to minimize recall bias associated with obstetrical history. Every phone call was started by obtaining direct informed consent from the subject. To access the clinical obstetric outcomes of kidney donors, the following factors were included in questionnaires; number of pregnancies, year of pregnancy, age at donation and delivery, body weight, and height at time of delivery. To evaluate maternal outcomes, the presence of proteinuria, gestational hypertension, preeclampsia events, and cesarean section delivery were determined, as previously described [7,8]. Proteinuria was defined by positive results from a urine dipstick. An obstetrician diagnosed preeclampsia at the time of delivery. Preterm birth, fetal growth restriction, and fetal death were the primary fetal outcomes. Gestational age of less than 37 weeks was defined as a preterm birth, and fetal body weight of less than 2.7 kg was defined as indicative of fetal growth restriction. Baseline characteristics were compared using the t test for continuous variables and the chi-squared test for categorical variables. In this study, matching variables were selected to adjust for factors affecting pregnancy outcome. 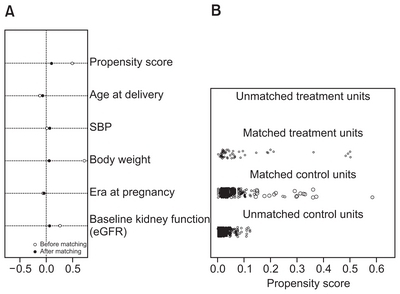 To select the matched non-donor control subjects, 10:1 propensity score matching (PSM) was applied using variables that showed significant differences among the study and control groups, such as age at delivery, era at pregnancy, systolic blood pressure, body weight, and baseline kidney function using eGFR. Differences between groups were presented as standardized difference values before and after PSM (Fig. 2). Recent studies have shown that in addition to CKD , episodic AKI also affects pregnancy outcome . Therefore, we tried to control for differences in baseline kidney function between the groups. Body weight was selected as a matching variable because being overweight or obese is a well-known risk factor for hypertensive complications during pregnancy in patients without a history of preeclampsia , and is also an independent risk factor for incident hypertension after kidney donation . The balance between the donor group and non-donor control groups was evaluated using the standardized difference, quintile–quintile (QQ) plot of continuous covariates, and histogram of the distance measured to minimize the propensity score . Fig. 2 summarizes the distribution of propensity scores and changes in propensity scores in various attributes before and after matching. The authors performed PSM with the PSM Match It application using R (open source package, version 3.2.1, http://www.r-project.org). Two-sided P values of 0.05 indicated statistical significance. SPSS Statistics software (version 22.0; IBM Corp., Armonk, NY, USA) was used for statistical analysis. A total of 426 pregnancies from 225 kidney donors were included in the final analyses (Fig. 1). Among them, 21 women had been pregnant both before and after donation. Table 1 shows a comparison of the baseline characteristics of pre-donation pregnancies and post-donation pregnancies. There were 56 pregnancies after kidney donation, of which data for 39 donors were obtained. Of patients with post-donation pregnancy, 71.4% had been donors relatively recently (i.e., 2007–2014). The mean age at delivery was 26.6 ± 4.0 years old in the pre-donation pregnancy group and 32.0 ± 3.8 years old in the post-donation pregnancy group. The mean body weight at the time of donation was 57.9 ± 8.4 kg in the pre-donation pregnancy group, and 64.0 ± 12.7 kg in the post-donation pregnancy group. Although more time elapsed from kidney donation to phone poll response in the post-donation pregnancy group, there was no significant difference in the development of diabetes or hypertension among the groups. Next, fetal and maternal outcomes in pre-donation and post-donation pregnancies were compared, and Table 2 summarizes the results. There were no significant differences in fetal outcomes between the pre-donation and post-donation groups except for fetal growth restriction. In terms of maternal outcomes, the development of proteinuria, gestational hypertension, and preeclampsia seemed to increase, although the differences were not significant between the pre-donation pregnancy and post-donation pregnancy groups. However, the proportion of donors who received a cesarean section was significantly higher in the post-donation pregnancy group than in the pre-donation pregnancy group (33.9% vs. 21.6%, P = 0.005). Based on these results, further comparisons with the non-donor matched control group only included the post-donation pregnancy group. Table 2 also compares maternal and fetal outcomes in the post-donation pregnancy group with that of the non-donor control group without matched analysis. In terms of fetal outcomes, fetal death rate was not different between the post-donation group and non-donor control group; however, donors who were pregnant after donation had a longer gestational duration than the non-donor controls and none of them experienced preterm birth. Fetal growth restriction was not shown in the post-donation pregnancy group, which was significantly lower than in the non-donor control group (16.3%). Preterm birth was also higher in the non-donor control group than in the post-donation pregnancy group. Regarding maternal outcomes, proteinuria was only recorded in one case (1/56, 1.8%) in the post-donation group compared with the non-donor unmatched control group (133/2,932, 4.5%; Table 2). Gestational hypertension and preeclampsia events were not different than those in the non-donor unmatched control group. The proportion of cesarean sections in the post-donation group was significantly higher than that in the non-donor unmatched control group (33.9% vs. 26.2 %, P = 0.028). Baseline characteristics of patients were compared between the post-donation pregnancy group and normal pregnancy control group before and after PSM. Before PSM, between-group differences were identified in age at delivery, systolic blood pressure, body weight, era at pregnancy, and baseline kidney function estimated using eGFR. These characteristics are summarized in Table 3. Patients in the post-donation pregnancies group had a higher body weight than those in the unmatched control group (64.0 ± 12.7 vs. 54.6 ± 7.9 kg, respectively; P < 0.001, standardized difference 0.726). There were no differences in age at delivery or systolic blood pressure between the groups, and there was a marginal difference in eGFR between the groups (101.8 in post-donation pregnancies group vs. 96.6 mL/min/1.73 m2 in unmatched control group; P = 0.065, standardized difference 0.258). As shown in Fig. 2 and Table 3, between-group differences decreased after PSM, and there were comparable distributions of age at delivery, systolic blood pressure, and baseline kidney function using eGFR between the groups. However, the differences in body weight and era at pregnancy remained after adjustment for propensity score. Further comparative analysis was performed between the post-donation pregnancy group and the non-donor matched control group in this study to overcome limitations of previous studies that compared only pre-donation and post-donation pregnancy outcomes. The odds ratios (OR) for maternal and fetal outcomes in each group are presented in Table 4. There were three cases of composite outcomes for proteinuria, gestational hypertension, and preeclampsia events in the post-donation pregnancy group (5.4%) and 37 events in the matched control group (8.4%) (OR, 0.63; 95% confidence interval [CI], 0.19–2.14; P = 0.724) (Table 4). Gestational hypertension was identified in three donors (OR, 0.89; 95% CI, 0.20–3.98; P = 0.889), and two cases had been diagnosed as preeclampsia (OR, 0.67; 95% CI, 0.08–5.26; P = 0.704) in the post-donation pregnancy group. There were no differences in fetal death; however, preterm birth and fetal growth restriction were prominent in the non-donor matched control group. The risk of cesarean section was marginally higher in the post-donation group (OR, 1.87; 95% CI, 1.00–3.51, P = 0.049). Kidney transplantation is the best treatment option for inpatients with ESRD [1–3]; consequently, there have been attempts to overcome donor-organ shortages. Globally, a higher proportion of kidney donors are women than men [18,19]. Although there is a need to promote kidney donation, various women health problems after kidney donation are significant obstacles to overcome when encouraging kidney donation. Although current data are limited, these issues should be considered when a woman decides to donate her kidney. The Best Practice in Live Kidney Donation Consensus Conference of 2014 advised that potential donors with reproductive potential should be counseled on the possibility of a greater likelihood of gestational hypertension or preeclampsia if they choose to donate a kidney . Living kidney donation appears to increase the risk of gestational hypertension and preeclampsia compared with the experience of otherwise similarly healthy women. Consistent with the recommendations of a 2015 American Society of Transplantation (AST) consensus statement and Kidney Disease: Improving Global Outcomes (KDIGO) clinical practice guidelines, the Organ Procurement and Transplantation Network (OPTN) policy requires that women donor candidates are informed of the increased risk of preeclampsia or gestational hypertension in pregnancies after donation [20,21]. In this study, we investigated the post-donation pregnancy outcomes of women donors by comparisons with pre-donation pregnancies and matched non-donor controls. We revealed that pregnancies after donation did not have worse fetal and maternal outcomes, except for an increase in cesarean section operations. This is the first study on the pregnancy outcomes of women donors in the Asian population. The main strength of our study is that it compared donors with matched controls, as in the Ontario study . It also included a large, validated, normal pregnancy control group. Two important studies in the past compared pre-donation and post-donation pregnancy outcomes [13,14]; however, the risk of post-donation complications may have been overestimated in these studies because donors were also included in the pre-donation pregnancy group due to their approach to health screening. Even though the Norway study compared information from a large registry with a large control group  and the Minnesota group included long-term follow-up data on creatinine levels, blood pressure, and proteinuria , these studies have some limitations. In the Norway study, obstetric diagnosis and treatment were inconsistent because the results were retrospectively analyzed from registry data. In our study, medical chart review and data abstraction using diagnosis codes only covered the delivery records in our study hospitals. Additionally, we used telephone questionnaires to include information on pregnancies that may have occurred outside of our study hospitals. The Minnesota study was limited because results were based on surveys and could have been biased by non-responders (180 non-responders and 333 individuals were not contacted). Some responders reported that their pregnancies occurred 40 years prior, indicating the potential for recall bias and inaccurate information. These studies show that the incidence of severe maternal and fetal outcomes among living kidney donors was low: < 1% for maternal and fetal death and < 10% for preeclampsia and preterm birth before 37 weeks of gestation [6,13,14]. Most living kidney donors in these studies had uncomplicated pregnancies after donation. A recent meta-analysis identified a more than two-fold increased relative risk of preeclampsia in donors but no significant difference in the risk of gestational hypertension, low birth weight, or preterm birth compared with normal pregnancies . Although the relative risk of preeclampsia is elevated in donors, the absolute risk remains low. Moreover, the generalizability is limited due to few previous studies. Therefore, further studies are warranted to provide appropriate information to living kidney donor candidates who plan for future pregnancy [6,13,14]. Instead of conducting a mail survey in our study, trained nurse practitioners conducted a telephone survey (after obtaining direct informed consent) to increase the response rate and reduce recall bias. Comparative analysis was performed by comparing donor post-donation pregnancies to those of a matched control group. Interestingly, there was an increased risk of cesarean resection in the post-donation pregnancy group than in the post-donation group and the normal control group. There are possible explanations for this; for example, complications related to living donor nephrectomy, even during a laparoscopic procedure, could have had an influence. However, there are no conclusive studies on the association between kidney donation and obstetric surgery. Thus, there is a need for further studies into possible associations between appropriate obstetric surgery timing and kidney donation. Racial differences in ESRD progression [23–25] and mortality [26,27] are important to consider for donors after nephrectomy. Because previous studies of post-donation pregnancy outcomes mainly involved Caucasian populations [13,14,28], their results may not be directly generalizable to Asian populations. Pregnancy complications in the general population are more common in African Americans than in Caucasians and Asians . Another study showed that pregnancy complications are less common in Asians than in Caucasians . In a Norwegian study  well known for assessing pregnancy complications in kidney donors, hypertensive complications occurred in 5.7% of the post-donation pregnancy group, similar to the 5.5% reported in the Minnesota study  and 6.0% identified in the current study. This study has some limitations. At first, there were too few post-donation pregnancies (56 cases) to provide a rigorous assessment of statistical significance. Another important limitation is that high-risk mothers with poor maternal and fetal outcomes were included in the non-donor pregnancy control group. Globally, general gestational care does not include measurement of serum creatinine . Mothers with gestational serum creatinine values often had medical or obstetrical issues during their pregnancies. Our non-donor controls were extracted from two tertiary hospitals, indicating that they might have underlying diseases or risk factors. To reduce the limitations of high-risk controls, the authors tried to exclude mothers with confirmed underlying diseases that would not be considered suitable as kidney donors (Fig. 1). Because serum creatinine levels are not routinely measured in pregnant women in general obstetric practice, our controls were considered the best available option. Further studies may be helpful to compare post-donation pregnancy outcomes with “general pregnancies”, although renal function cannot be adjusted. In conclusion, fetal and maternal outcomes for post-donation pregnancies are comparable to those of the non-donor control group. Well-designed studies with more appropriate controls group are warranted to increase the donation rate of kidneys from living women in the future. DM, diabetes mellitus; eGFR, estimated glomerular filtration rate; HTN, hypertension; SBP, systolic blood pressure; SNUBH, Seoul National University Boramae Hospital; SNUH, Seoul National University Hospital. Fig. 2. Difference in propensity score between post-donation pregnancy group and non-donor control group before and after propensity matching. 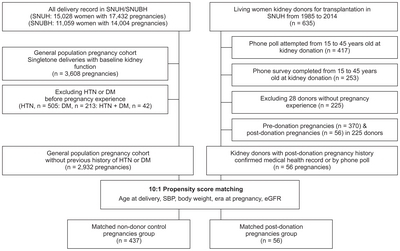 Using propensity score matched analysis, differences in baseline characteristics were minimized between post-donation pregnancy group and non-donor matched control group. (A) Changes in propensity scores of attributes before and after matching. (B) Distribution of propensity scores. eGFR, estimated glomerular filtration rate; SBP, systolic blood pressure. Data are presented as number only, number (%), or mean ± standard deviation. BMI, body mass index; DM, diabetes mellitus; HTN, hypertension. Body weight (kg) at time of donation for transplant operation. Comparisons of maternal and fetal outcomes between the post-donation pregnancy group and pre-donation pregnancy group. Comparisons of maternal and fetal outcomes between the post-donation pregnancy group and normal pregnancy unmatched control group. Data are presented as number (%). 95% CI, 95% confidence interval. Wolfe, RA, Ashby, VB, and Milford, EL (1999). Comparison of mortality in all patients on dialysis, patients on dialysis awaiting transplantation, and recipients of a first cadaveric transplant. N Engl J Med. 341, 1725-1730. Yoo, KD, Kim, CT, and Kim, MH (2016). Superior outcomes of kidney transplantation compared with dialysis: an optimal matched analysis of a national population-based cohort study between 2005 and 2008 in Korea. Medicine (Baltimore). 95, e4352. Laupacis, A, Keown, P, and Pus, N (1996). A study of the quality of life and cost-utility of renal transplantation. Kidney Int. 50, 235-242. Siminoff, LA, Burant, CJ, and Ibrahim, SA (2006). Racial disparities in preferences and perceptions regarding organ donation. J Gen Intern Med. 21, 995-1000. Grams, ME, Sang, Y, and Levey, AS (2016). Kidney-failure risk projection for the living kidney-donor candidate. N Engl J Med. 374, 411-421. Garg, AX, Nevis, IF, and McArthur, E (2015). Gestational hypertension and preeclampsia in living kidney donors. N Engl J Med. 372, 124-133. Park, S, Yoo, KD, and Park, JS (2018). Pregnancy in women with immunoglobulin A nephropathy: are obstetrical complications associated with renal prognosis?. Nephrol Dial Transplant. 33, 459-465. Boudville, N, Prasad, GV, and Knoll, G (2006). Meta-analysis: risk for hypertension in living kidney donors. Ann Intern Med. 145, 185-196. Garg, AX, Muirhead, N, and Knoll, G (2006). Proteinuria and reduced kidney function in living kidney donors: a systematic review, meta-analysis, and meta-regression. Kidney Int. 70, 1801-1810. Tangren, JS, Powe, CE, and Ankers, E (2017). Pregnancy outcomes after clinical recovery from AKI. J Am Soc Nephrol. 28, 1566-1574. Piccoli, GB, Cabiddu, G, and Attini, R (2015). Risk of adverse pregnancy outcomes in women with CKD. J Am Soc Nephrol. 26, 2011-2022. Reisaeter, AV, Røislien, J, Henriksen, T, Irgens, LM, and Hartmann, A (2009). Pregnancy and birth after kidney donation: the Norwegian experience. Am J Transplant. 9, 820-824. Ibrahim, HN, Akkina, SK, and Leister, E (2009). Pregnancy outcomes after kidney donation. Am J Transplant. 9, 825-834. Bigelow, CA, Pereira, GA, and Warmsley, A (2014). Risk factors for new-onset late postpartum preeclampsia in women without a history of preeclampsia. Am J Obstet Gynecol. 210, 338.e1-338.e8. Sanchez, OA, Ferrara, LK, Rein, S, Berglund, D, Matas, AJ, and Ibrahim, HN (2018). Hypertension after kidney donation: incidence, predictors, and correlates. Am J Transplant. 18, 2534-2543. Austin, PC (2011). An introduction to propensity score methods for reducing the effects of confounding in observational studies. Multivariate Behav Res. 46, 399-424. Matas, AJ, and Hays, RE (2018). Gender disparities and financial barriers to living kidney donation. J Am Soc Nephrol. 29, 1081-1083. Bloembergen, WE, Port, FK, Mauger, EA, Briggs, JP, and Leichtman, AB (1996). Gender discrepancies in living related renal transplant donors and recipients. J Am Soc Nephrol. 7, 1139-1144. LaPointe Rudow, D, Hays, R, and Baliga, P (2015). Consensus conference on best practices in live kidney donation: recommendations to optimize education, access, and care. Am J Transplant. 15, 914-922. Lentine, KL, Kasiske, BL, and Levey, AS (2017). KDIGO clinical practice guideline on the evaluation and care of living kidney donors. Transplantation. 101, S1-S109. O’Keeffe, LM, Ramond, A, and Oliver-Williams, C (2018). Mid- and long-term health risks in living kidney donors: a systematic review and meta-analysis. Ann Intern Med. 168, 276-284. Lentine, KL, Schnitzler, MA, and Garg, AX (2015). Race, relationship and renal diagnoses after living kidney donation. Transplantation. 99, 1723-1729. Muzaale, AD, Massie, AB, and Wang, MC (2014). Risk of end-stage renal disease following live kidney donation. JAMA. 311, 579-586. Lentine, KL, and Segev, DL (2013). Health outcomes among non-Caucasian living kidney donors: knowns and unknowns. Transpl Int. 26, 853-864. Mjøen, G, Hallan, S, and Hartmann, A (2014). Long-term risks for kidney donors. Kidney Int. 86, 162-167. Maggiore, U, Budde, K, and Heemann, U (2017). Long-term risks of kidney living donation: review and position paper by the ERA-EDTA DESCARTES working group. Nephrol Dial Transplant. 32, 216-223. Garg, AX, McArthur, E, and Lentine, KL (2015). Gestational hypertension and preeclampsia in living kidney donors. N Engl J Med. 372, 1469-1470. Bryant, AS, Worjoloh, A, Caughey, AB, and Washington, AE (2010). Racial/ethnic disparities in obstetric outcomes and care: prevalence and determinants. Am J Obstet Gynecol. 202, 335-343.